One of our recent challenges was a job at a house in Hampstead. The owner had called and was at the end of her tether with squirrels that had made a nest in her solar panelling on the roof. The whole situation was a complete nuisance, with the mess, disruption and also, noise. Luckily, we had just the tools for the job! Upon arriving at the property, we constructed a tower up the back of the house in order to provide safe and convenient access. It is always the aim of PPSP to get the job done swiftly and thoroughly, with safety as our first priority. Once this had been constructed, our presence alone was enough to disturb and dislodge the squirrels who were present on the rooftop. This allowed us to continue the next part of our process efficiently and without interruption. Once we were on the roof, the next part of the process involved a damage evaluation, where we checked to see if the squirrels had caused any damage to the panels. 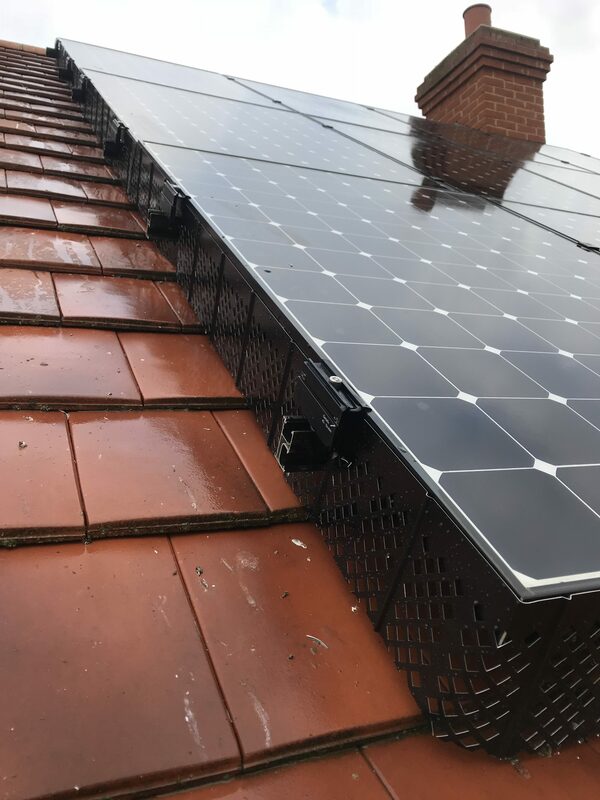 Luckily, in this case, the panels had not been affected by the nesting of the squirrels, which allowed us to continue onto the next part of the procedure swiftly Squirrel proofing solar panels. Next, we wrapped the panels in reinforced stainless steel mesh, in order to prevent any access from rodents or birds. The mesh acts a perfect deterrent in this case, and prevents any future occurrences of a similar nature. Once the mesh was in place, we washed the panels down with pure water to improve performance. PPSP are proud to offer a thorough service, so we cleaned the rooftop and also cleared the guttering, in order to prevent any future issues. Before leaving the rooftop, we checked and secured all the panels to ensure that they were in full working order. It is important to our values as a company that our customers are fully satisfied with every aspect of the service we provide.